I recently had a most memorable week - basing myself, at the stunning property of Montauto owned by the Cecchi family, situated across from the town of San Gimignano in Tuscany, Italy. I have had the pleasure to visit with the Cecchi family on several occasions over the years. Since 2004 brothers Cesare and Andrea Cecchi have run the winery with their mother, Anita; and have clearly inherited their father Luigi’s spirit, determination, attention to detail, enthusiasm and passion. The family’s head-office, winery and original estate vineyards have been in grape production for almost 1,000 years, situated in the borough of Castellina in Chianti, an area which has traditionally produced Chianti Classico. In their substantial, modern cellars and winery; equipped with the latest winemaking equipment, the crafting of their varied range of quality wine is carried out. The fermentation process is carried out at their four modern vineyards distributed in renowned DOC(G) zones in Tuscany and Umbria: Villa Cerna in the Chianti Classico region, Castello di Montauto at San Gimignano, Val delle Rose near Grosseto, and Tenuta Alzatura at Montefalco in Umbria. Cecchi is a very dynamic family winery, who has not lost touch with their history, ‘terroir’, and are always looking to push themselves to do better each vintage and with each new wine and project. They are constantly being true and honest to their philosophies and to their locations, grapes - which is no easy task with local and international pressures on their every decision. It must be made clear to new wine enthusiasts - ‘Traditional wines, doesn't mean old wines’, also as Andrea says: “The future should not be a repetition of the past, but an improvement on it." This was clearly evident in the wines we sampled together. In the past few decades, Tuscany have researched and learnt to grow better Sangiovese. For example planting vines closer together, resulting in fewer but more flavourful grapes per vine, and endeavouring to harvest them much riper. Allowing them to be able to stop using the many blending grapes, and today many Chianti’s are 90 or even 100% Sangiovese - and all the better for it. The Cecchi family have been at the heart of Tuscany’s most important of innovations and wine styles; while being strong not to adopt all concepts that don’t fit their philosophy. Currently they are not making ‘Super Tuscan’ wines, where French varietals dominate the blend of the red wine, but their wines (e.g. Coevo) are no less complex or intense with strong personality and character. Their wines focus on approachability with definite elegance, and a long finish. The Cecchi family are also working with an ancient; traditional grape variety that almost become extinct in Italy - Sagrantino, from the Umbria region south of Tuscany. Intense in colour, firm tannins that benefit from several years in oak aging to develop mouth feel and balance, with rich fruit notes, and spice flavours - it has been stated before; that a bottle of Cecchi wine has its own defined history. On the Thursday we made our way to the stunning location, plus exciting project which is the new winery development and cellars of ‘Val delle Rose’ located in Maremma, in Southern Tuscany. This exciting wine region with its rolling hills, located near the coast is fast developing a reputation for producing wines of pedigree and character. Val delle Rose was established in 1996 - after several years of in-depth research the family purchased the Val delle Rose estate and have invested a significant amount of time and money into replanting vines and building one of the world’s most advanced wineries. Recently being awarded the highest accolade in the land for building a bespoke water recycling, phyto-treatment plant for the regeneration of waste water on the site. This sun drenched strip of land on the Tuscan coastline, which includes the areas of Bolgheri (famous for several Super Tuscans) and Morellino di Scansano, a classic area for Sangiovese. 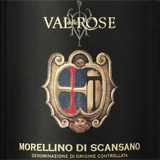 Morellino being the local name for Sangiovese; and Scansano being one of the towns within the ‘Protected Designation of Origin’ area. Val delle Rose’s vineyards planted on the hillside in great aspects are at approximately 150 metres above sea level, providing perfect exposure to the sun, which is moderated by the cooling sea breezes some 10kms away. When you spend time with Cesare and Andrea, or with any of the talented team here at Cecchi, you develop an understanding that the 4 diverse vineyard/winery sites have a common denominator - that being a vocation for the vine, which is also the starting point of the Cecchi philosophy. Cecchi is well positioned to tackle the climatic and market challenges the future will present. 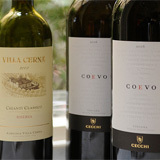 I am confident the Cecchi brand and diverse range of wines will not only excite 'new' wine enthusiasts - but for those select few in the know, will be singing its praises for all to hear - that wines from Cecchi are not only great expressions from Tuscany, but are some of the best wines in the world.